Malawi is one of the smallest countries in Africa, bordered entirely by other countries and to the east by Lake Malawi, which makes up about a third of Malawi’s area. In prehistory, it was home to small populations of hunter-gatherers before Bantu peoples settled around the 10th century. By 1500 AD the area formed part of the Kingdom of Maravi. The region was subject to the Arab slave trade, which reached a maximum in the 19th century, and in the late 19th century came under British colonial rule. After independence in 1964 as a republic, Malawi saw one-party state politics until 1994. Since then, Malawi has seen multi-party government, with occasional political and civil unrest. Malawi’s economy is based on agriculture, which accounts for over a third of GDP and 90% of export revenues. Agricultural exports are dominated by tobacco, tea and sugar, mostly from large commercial farms. Market liberalisation in the 1990s saw more smallholder farmers enter agricultural markets. Smallholder, mostly rainfed, agricultural production, particularly of maize, is a majority livelihood activity. In recent years Malawi has granted licenses for hydrocarbon exploration in the East African Rift Valley, including Lake Malawi, but to date there are no proven hydrocarbon reserves. Malawi has abundant surface water resources, both Lake Malawi and many large perennial rivers flowing from the highland areas. However, most rural Malawians rely on groundwater for their domestic supply, and groundwater is increasingly used for irrigation by smallholder farmers. The country has also seen recent devastating floods (in 2015) and drought (e.g. in 2016), highlighting its lack of resilience to hydrological risk. Brighton Chunga, Mzuzu University, Malawi & Cranfield University, UK. Please cite this page as: Upton, Ó Dochartaigh, Chunga and Bellwood-Howard, 2018. Malawi. Map developed from USGS GTOPOPO30; GADM global administrative areas; and UN Revision of World Urbanization Prospects. For more information on the map development and datasets see the geography resource page. Malawi has four main physiographic zones: highlands or uplands; plateau areas; the rift valley escarpment; and the rift valley floor/plains. The highlands cover a relatively small area but can be 2000 m to 3000 m in elevation. The plateau areas cover much of the country, and are gently undulating surfaces from 750 m to 1300 m in elevation. They are cut into by wide valleys, or 'dambos', with grassy, swampy bases, which largely drain towards the rift valley floor. The rift valley escarpment consists of parallel faults with the land stepping down to the rift valley floor. The rift valley floor and plains extend along the shores of Lake Malawi and the upper Shire Valley; they have low relief and range from 100 m to 600 m in altitude. Malawi has two main seasons: a wet season from November to April and a dry season from May to October. Rainfall is influenced by topography, with the highest rainfall in upland areas and on slopes explosed to the prevailing northeasterly wet season winds. Annual rainfall exceeds 800 mm over most of the country. 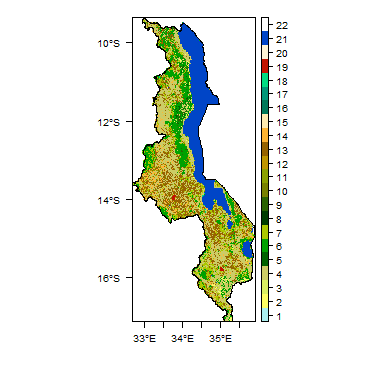 Lake Malawi and the upper Shire Valley receive relatively low rainfall. There are large interannual variations in rainfall. 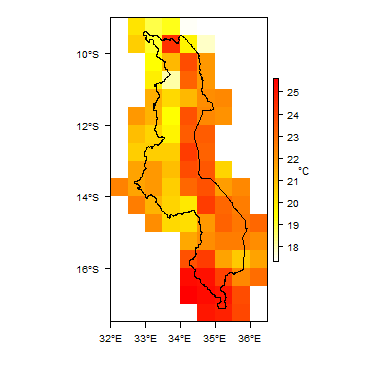 More information on average rainfall and temperature for each of the climate zones in Malawi can be seen at the Malawi climate page. Lake Malawi is the largest water body in Malawi, and is the dominant control on the surface water drainage network in the country. The only river flowing out of Lake Malawi is the Shire River, which flows south into Mozambique, where it flows into the Zambezi River. The main rivers flowing into Lake Malawi are the Songwe, South Rukuru, North Rukuru, Dwangua, Linthipe and Bua. The Songwe river marks Malawi's northern boundary with Tanzania, and flows into Lake Malawi at its northern end. The South Rukuru river is the main river in the Northern region of Malawi, flowing though the Nyika Plateau to the lake. The Bua and Dwangua rivers flow through central Malawi into the lake. These major rivers typically drain wide 'dambos' in the plateau areas, which have steep valley sides that become less steep as they reach the rift valley. The upper Shire Valley has a wide alluvial plain, changing to a narrower valley with gorges and rapids in the lower part. The next largest lake in Malawi is Lake Chilwa, which forms an internal drainage basin and mainly drains the northern uplands. Rivers flowing into the Chilwa basin tend to be ephemeral in their lower courses, losing water to permeable valley alluvial deposits. For water management purposes, Malawi is divided into 17 water resource areas (WRAs) based on river basins. Some WRAs consist of one river basin and others are composed of several small river basins. WRAs are divided into water resource units (WRUs). In 2014, 139 stations hydrological monitoring stations were reported as operational, including 136 Ministry of Agriculture, Irrigation and Water stations and 3 Water Board stations. Another 164 stations were reported as non-operational in 2014 (Republic of Malawi, 2014). More information is available in the National Water Master Plan (Republic of Malawi, 2014). Major surface water features of Malawi. Map developed from World Wildlife Fund HydroSHEDS; Digital Chart of the World drainage; and FAO Inland Water Bodies. For more information on the map development and datasets see the surface water resource page. Soil compositions tend to be closely related to the underlying geology. Sandy soils occur on many granitic areas of the basement complex, and at the edges of alluvial plains. Latosols, including ferrosols, are common. Many soils are lateritic, typically 1 to 3 m thick (Smith-Carington and Chilton 1983), and sometimes 5 to 20 m thick (BGS 2004). Other soils include lithosols on steep slopes of the uplands and rift valley escarpment; hydromorphic (water logged) soils, including vertisols, in dambos; and calcimorphic soils on alluvial plains (Smith-Carington and Chilton 1983). Soil Map of Malawi, from the European Commission Joint Research Centre: European Soil Portal. For more information on the map see the soil resource page. Land Cover Map of Malawi, from the European Space Agency GlobCover 2.3, 2009. For more information on the map see the land cover resource page. This section provides a summary of the geology of Malawi. More detail can be found in the references listed at the bottom of this page. Many of these references can be accessed through the Africa Groundwater Literature Archive. Geology of Malawi at 1:5 million scale. Developed from USGS map (Persits et al. 2002). For more information on the map development and datasets see the geology resource page. Most of the country is underlain by Precambrian to Lower Palaeozoic crystalline basement rocks. These are unconformably overlain in places, particularly in the north and south, by more recent sedimentary rocks or volcanic rocks. There is extensive Quaternary alluvium in valley bottoms and the rift floor plain. The main structural feature is the rift valley, which was formed by a subsidence fault during the Upper Mesozoic and Cenozoic, and is still active. Lake Malawi and the Shire Valley lie on the floor of the rift valley (UN 1989). Alluvial and lacustrine deposits Quaternary Clays, silts, sands and occasionally gravels, deposited in the floor of the rift valley, and along the lakes in the major valley floors (UN 1989). The lithology of the deposits is highly variable. They occur particularly in several basins along the rift valley shore, including at Karonga and Salima-Nkhotajota lakeshores and the in upper and lower Shire Valley (Chavula 2012). They vary in thickness along Lake Malawi, tending to increase closer to the lake shore to a maximum of 60 m. In the centre of the Shire Valley, alluvium is 40 to 80 m thick, and reaches 150 m thick in the lower Shire Valley (UN 1989). The alluvial deposits are faulted, caused by ongoing subsidence of the rift valley. Sungwa, Chiwondo, Chitembe, Dinosauric and Lupata Cretaceous to Quaternary These sedimentary rocks are found in small, narrow, elongated basins in the north of the country, running parallel to the shores of Lake Malawi. They include loosely consolidated sandstones and unconsolidated sands, sandy marls, clays and conglomerates, but are dominanted by aeolian desert sandstones, with abundant evaporite deposits in a limestone matrix (UN 1989). Intrusive plutonic rocks Jurassic These occur in the Chilwa region in the south, and comprise granitic and syenitic plutonic rocks. Stormberg volcanic rocks Jurassic A series of basaltic lava flows, interbedded with layers of sandstone and tuff (UN 1989). Karoo sedimentary series Permian-Triassic Karoo sedimentary rocks crop out in the north of Malawi, in north-south trending basins, and also to the southwest of the Shire Valley. They lie unconformably on crystalline basement. The base of the sedimentary sequence comprises conglomerates, sandstones, argillaceous rocks and coal seams; at the top of the sequence are arkosic sandstones, marls and more argillaceous rocks. The rocks are largely well cemented by calcite. They can be over 3500 m thick (UN 1989). Crystalline Basement Precambrian to Lower Palaezoic Dominantly gneiss and granulite; also some metamorphic schists, quartzites and marbles (UN 1989). The Mafinga and Mchinjin groups in the north and east comprise mainly unmetamorphosed sandstones and conglomgerates. Across the whole basement complex are outcrops of intrusive igneous rocks, such as the Nyika and Dzanalyama granites, syenites, and pegmatite and dolerite dykes (UN 1989). 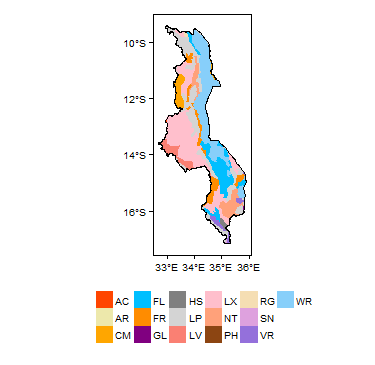 This section provides a summary of the hydrogeology of the main aquifers in Malawi. More information is available in the references listed at the bottom of this page. Many of these references can be accessed through the Africa Groundwater Literature Archive. Malawi is also covered by the SADC hydrogeological map and atlas (2010), available through the SADC Groundwater Information Portal. - crystalline basement rocks, which cover much of the country, and form a low yielding aquifer. There are only small occurences of other rock types. Although these can be important locally, relatively little is known of their hydrogeological properties. Alluvial and lacustrine deposits Alluvial and lacustrine deposits can form highly productive aquifers where they are better sorted and dominated by coarse grained sediment - sand and, sometimes, gravel - and where they are thick enough. The aquifer tends to be unconfined. Groundwater can be in hydraulic continuity with adjacent rivers or lakes. Water table depth is typically between 5 m and 10 m below the ground surface (Chavula 2012). Studies show that the average borehole yield from alluvial aquifers in Malawi is 15 l/s (litres/second); hydraulic conductivity ranges from 1 to 10 m/d; transmissivity ranges from 50 to 300 m²/day; and storage coefficient ranges from 1 x 10-2 to 5 x 10-2, and average borehole depth is 60 m (Chavula 2012). Groundwater in alluvial aquifers is typically more mineralised than in basement aquifers. 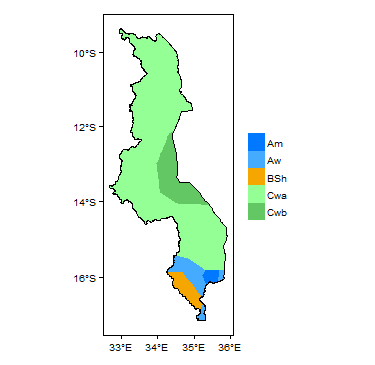 In some cases salinity levels are too high for potable water, such as in the lower Shire Valley and the eastern part of the Bwanje Valley (Chavula 2012). Chloride concentrations of up to 4000 mg/l and sodium concentrations up to 3600 mg/l have been recorded (Bath 1980). Groundwater salinity appears to be linked to the dissolution of evaporate minerals and/or evaporative concentration (BGS 2004). High fluoride concentrations of 2 to 20 mg/l have been found in some parts of the alluvial aquifers (Bath 1980). High iron concentrations of up to 80 mg/l and more are common (BGS 2004). Recharge occurs from direct rainfall infiltration and, where the aquifers are in hydraulic contact with rivers or lake water, by losses from surface water. 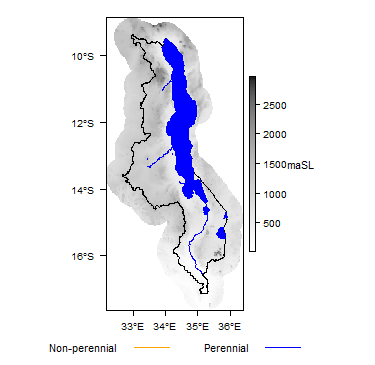 Studies estimate recharge to the eastern side of the lower Shire Valley alluvial aquifer at more than 200 mm/year (Chavula 2012). Cretaceous to Quaternary sedimentary rocks These rocks are likely to have relatively high porosity and intergranular permeability. They may form moderate to highly productive local aquifers. Stormberg volcanic rocks The most porous and permeable parts are in the weathered zones of contact between lava flows. These may form moderate productivity local aquifers. Plutonic intrusions of granite and syenites in the Chilwa province Likely to have very low groundwater potential. Karoo sedimentary sequence The rocks of the Karoo are generally well-cemented with low porosity and intergranular permeability. Groundwater storage and flow occurs largely in fractures in the rocks. Groundwater levels are typically 20 m to 30 m below ground surface (UN 1989). These rocks may form a low to moderate productivity local aquifer. The basement complex rocks have virtually no primary (intergranular) permeability, but can form an aquifer where they have been sufficiently weathered in-situ, to form a layer of unconsolidated saprolitic weathered material. This weathered zone is best developed in the plateau areas, where it is often 15 m to 30 m thick, and locally even thicker (Chavula 2012). The best development of weathered saprolite tends to be associated with fractures, often along fracture zones. The aquifer is usually unconfined. The depth to water table is typically between 15 m and 25 m below the ground surface (Chavula 2012). The average borehole yield is 1 to 2 l/s. Hydraulic conductivity ranges from 0.5 to 1.5 m/d. 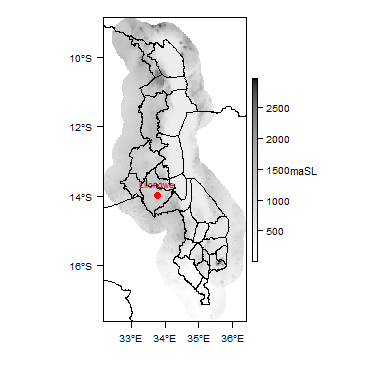 Transmissivity ranges from 5 to 35 m²/day. Storage coefficient ranges from 1 x 10-2 to 5 x 10-2. Boreholes tend to be 45 to 50 m deep (Chavula 2012). Groundwater is typically of good quality, with slightly acidic to neutral pH (~6.4 to 7.0). Total dissolved solids (TDS) are usually less than 1000 mg/l, and typically around 350 mg/l (Chavula 2012), but occasionally there is elevated salinity, sometimes linked to high sulphate concentrations and in others possibly linked to the dissolution of evaporate minerals (BGS 2004). Fluoride concentrations are typically relatively low, less than 1 mg/l (BGS 2004). There is a lack of information about the quantitative status of groundwater across Malawi, because there is relatively little groundwater level monitoring. The natural quality of groundwater across much Malawi is thought to be generally suitable for drinking (Chavula 2012). However, groundwater chemistry is highly dependent on aquifer lithology (rock type and mineralogy), and so it is highly variable spatially. Groundwater in alluvial aquifers is generally more mineralised than that in basement aquifers, and a number of boreholes in alluvial aquifers have been abandoned due to high salinity (Chavula 2012). Chemical parameters that are elevated in different areas include fluoride, sulphate, iron, chloride and nitrate. Fluoride concentrations of more than 1.5 mg/l are common in groundwater in alluvial aquifers in the Salima/Nkhotakota and Karonga lakeshore areas (Chavula 2012). Generally, groundwater from boreholes is of better microbiological quality than groundwater from dug wells, which tend to be more vulnerable to contamination (Chavula 2012). Research on shallow wells in southern Malawi in 2008 and in northern Malawi in 2013 showed unacceptably high levels of microbiological contaminants in shallow wells (Msilimba and Wanda 2013, Pritchard et al. 2008). General overviews of groundwater quality in Malawi can be seen in Bath (1980), BGS (2004), and Water Department/UNDP (1986) (see hydrogeology reference list, below). The revised National Water Master Plan (Republic of Malawi 2014) states that the priority for consumptive water use is for domestic water, irrigation and livestock. There is little information or knowledge about environmental water flows or how groundwater supports environmental flows, or any guidelines for estimating them. Potential interactions between river flows and groundwater are only investigated occasionally on a case by case basis, if there are known problems. The revised Water Master Plan recommends strengthening investigation and monitoring of these issues and the development of guidelines. Groundwater is widely used across Malawi for both domestic and agricultural purposes. There were about 30,000 water boreholes and 8,000 protected hand dug wells in 2012 (Chavula 2012). Drought and poor water quality have meant more people are turning from hand dug wells to drilled boreholes. Estimates show that 65% of the population depends on groundwater for domestic supply: in rural areas, this rises to 82%, while in urban areas is it closer to 20%, although a number of towns or districts within towns get most of their water supply from groundwater (Chavula 2012). Groundwater is increasingly used for irrigation by smallholder farmers, often from hand dug wells, and increasingly using treadle pumps, particularly in dambo areas (wetlands where fodder grasses grow year-round). Market gardens and paddy fields are sometimes developed on the edges of dambos, spreading labour demand through the year (Mzembe 1992). The Ministry of Agriculture explicitly recommended expanding groundwater use for irrigation in 1999 and again in 2013, leading to an expansion in treadle pumps and boreholes. Several dambo irrigation schemes were developed by government in the 1980s, in most cases government owned but which eventually gave way to community run schemes, although some have been affected by the marketisation of traditional land access arrangements (Kambewa 2005). There is also a large scale irrigation scheme in the Salima district, where groundwater from an alluvial aquifer is extensively used for horticultural crops and agro processing. Some farmers use groundwater for livestock watering (Chavula 2012). Boreholes fitted with hand pumps are standard for rural groundwater supplies. The use of motorised pumps is widespread, particularly by farmers; and treadle pumps are becoming more widely used. Recent droughts may have contributed to changing preferences for boreholes rather than hand-dug wells. The Water Resources Act of 1969 was replaced by the Water Resources Act of 2013. Part of the new Act was to establish the National Water Resources Authority. Since 2013, there has been ongoing development and reorganisation within government agencies concerning how groundwater, and other water, resources are managed. - coordinating the preparation and implementation of a water action plan. The Groundwater Division of the Ministry of Agriculture, Irrigation and Water Development formerly is currently responsible for groundwater management, including management of groundwater data, and assisting with assessment of groundwater abstraction applications; while the responsibility for operating and maintaining boreholes lies with the Water Supply department (Chavula 2012). The NWRA works alongside the Shire River Basin Management Board, which is a pilot board created under a World Bank project, the Shire River Basin Management Programme. Ultimately, the aim is that the NWRA will oversee river basin / catchment management authorities or boards across the country, based on the major river basins. In much of the country, the practical development of groundwater resources is currently dominantly carried out by NGOs, the donor community and the private sector, in collaboration with the NWRA and the Ministry of Agriculture, Irrigation and Water Development (Chavula 2012). In 2016, the Ministry of Agriculture, Irrigation and Water Development published a technical manual and a set of guidelines for groundwater well/borehole development. The manual covers topics such as effective well/borehole siting, different drilling methods and detailed techniques, pump selection, headwork construction, spring development and borehole rehabilitation. The guidelines are practical Standard Operating Procedures for groundwater sampling, aquifer pumping test, groundwater level monitoring, groundwater use permitting and drilling and construction of national monitoring boreholes. These are available to download from the RWSN website. There is a groundwater level monitoring network of approximately 35 boreholes across the country. In 2012, it was reported that monitoring was only being done at 18 of these boreholes (Republic of Malawi, 2014). At least some of these are equipped with automatic water level monitors. Some groundwater quality monitoring is also done, as part of a network of 195 water quality monitoring points (for surface water, groundwater, and pollution control at specific effluent outlets), but it has not been systematic, due to budgetary constraints (Republic of Malawi, 2014). In 2016, the Ministry of Agriculture, Irrigation and Water Development published a technical manual and guidelines that include groundwater monitoring and groundwater data management, including operating and managing the national groundwater database. These are the same manual and guidelines described above for groundwater development topics, and they are available to download from the RWSN website. Since 2014, a World Bank funded project on national hydrogeological and water quality mapping carried out development work for the national groundwater level and quality monitoring network. Many groundwater projects have been carried out in Malawi. Information on some major past groundwater projects, with web links to project results and outputs, can be found on the Malawi Groundwater Projects page. The following references provide more information on the geology and hydrogeology of Malawi. These, and others, can be accessed through the Africa Groundwater Literature Archive. Anscombe JR. 2011. Consultancy Services: Quality Assurance of UNICEF Drilling Programes for Boreholes in Malawi: Final Report. Report prepared for UNICEF / Ministry of Agriculture, Irrigation and Water Development, Government of Malawi. Bath AH. 1980. Hydrochemistry in groundwater development: report on an advisory visit to Malawi. British Geological Survey Report WD/OS/80/20. BGS. 2004. Groundwater Quality: Malawi. British Geological Survey/WaterAid. Chavula GMS. 2012. Malawi. In: Groundwater Availability and Use in Sub-Saharan Africa: a review of fifteen countries. Pavelic P et al. (Eds). International Water Management Institute, Sri Lanka. Chowns E. 2015. Is community management an efficient and effective model of public service delivery? Lessons from the rural water supply sector in Malawi. Public Administration and Development, 35(4), 263-276. Climate Justice Fund. 2015. Sustainable Groundwater Management in Malawi: Overview of the Hydrogeological Project Management for Sustainable Groundwater Resources in the Lower Shire Malawi. Video. GEF-TWAP. 2015. Transboundary Aquifer Information Sheet: AF17 - Shire Valley Alluvial Aquifer. Report prepared for GEF Transboundary Water Assessment Programme. Jimu IM. 2008. The role of stakeholders in the provision and management of water kiosks in Nkolokoti, Blantyre (Malawi). Physics and Chemistry of the Earth, Parts A/B/C, 33(8), 833-840. Kambewa D. 2005. Access to and monopoly over wetlands in Malawi. A Paper Presented at the International Workshop on African Water Laws, Plural Legislative Framework for Rural Water Management in Africa, 26-28. Kamwamba‐Mtethiwa J, Namara R, De Fraiture C, Mangisoni J & Owusu E. 2012. Treadle pump irrigation in Malawi: Adoption, gender and benefits. Irrigation and Drainage, 61(5), 583-595. Malawi Ministry of Agriculture, Irrigation and Water Development. 2016. Technical Manual for Water Wells and Groundwater Monitoring Systems and Standard Operating Procedures for Groundwater. Ministry of Water Development and Irrigation. 2012. Malawi Sector Performance Report 2011: Irrigation, Water and Sanitation. Final Report, June 2012. Mzembe CP. 1992. Wetland development and management in Malawi. Irrigation Management Network Paper. Pritchard M, Mkandawire T, & O’Neill JG. 2008. Assessment of groundwater quality in shallow wells within the southern districts of Malawi. Physics and Chemistry of the Earth, Parts A/B/C, 33(8), 812-823. Republic of Malawi. 2014. Ministry of Agriculture, Irrigation and Water Development. Project for National Water Resources Master Plan in the Republic of Malawi Final Report Volume II: Main Report. RWSN. 2014. Water Point Mapping and Monitoring Series. A Decade of WPM. Sehatzadeh M. 2011. 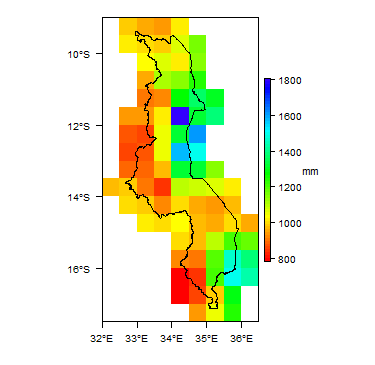 Groundwater Modelling in the Chikwawa district, lower Shire area of southern Malawi. Masters Thesis, Department of Geosciences, University of Oslo. Smith-Carington AK and Chilton PJ. 1983. Groundwater resources of Malawi. Department of Lands, Valuation and Water; Republic of Malawi, Lilongwe. UN. 1989. Malawi: Ground water in Eastern, Central and Southern Africa. Natural Resources/Water Series No. 19, ST/TCD/6. United Nations Department of Technical Cooperation for Development. Wanangwa GJ. 2018.Borehole drilling supervision in Malawi: why it is essential, not optional. RWSN blog post. Water Department/UNDP. 1986. National Water Resources Master Plan. Malawi Government. NOTE this was replaced by an updated version: Republic of Malawi, Ministry of Agriculture, Irrigation and Water Development, 2014 - see above. Wright E. 1992. The hydrogeology of crystalline basement aquifers in Africa. In Wright EP and Burgess WG (eds), Hydrogeology of Crystalline Basement Aquifers in Africa, Geological Society Special Publication No 66, pp 1-27. This page was last modified on 18 February 2019, at 17:36.